Enjoy an adrenaline-packed adventure, ideal for both adults and teenagers, on this eight-night tour of Vietnam. You’ll explore the north of the country by bicycle and boat, travelling through untouched countryside, villages and UNESCO bays. 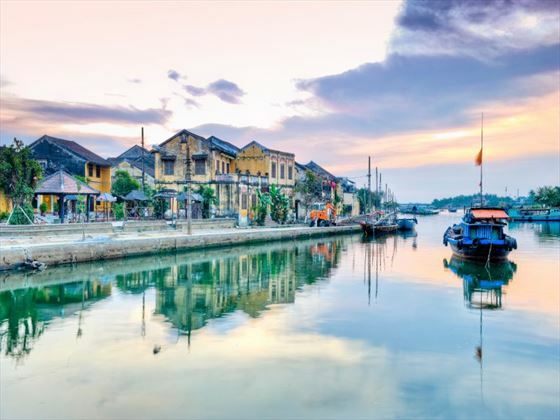 The tour begins in Vietnam’s charming capital, Hanoi, and continues to the beauty spots Mai Chau, Ninh Binh and Halong Bay, ending in the historic port city Hoi An. Tour highlights include staying with locals at a village homestay in Mai Chau, cycling through rice fields, and spending two nights in Halong Bay, where you’ll kayak past floating villages and through hidden grottos. There’s also a chance to tour Hoi An and the capital Hanoi, where you’ll see ancient temples and cycle around huge lakes. This trip offers the perfect dose of adventure and culture, ideal for active families (INT). Cycle through Vietnam’s countryside, among rice paddies and limestone mountains. Kayak on UNESCO-listed Halong Bay and discover caves and grottos. 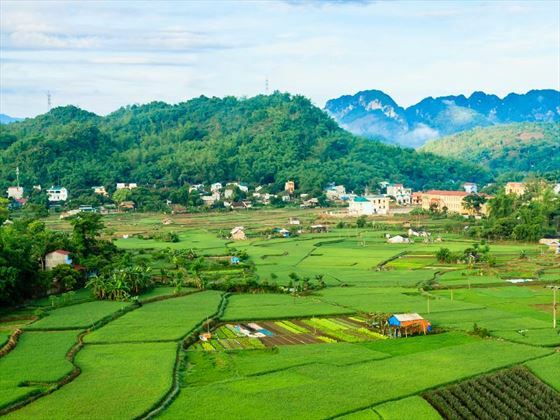 Stay with locals in a traditional village homestay in Mai Chau. 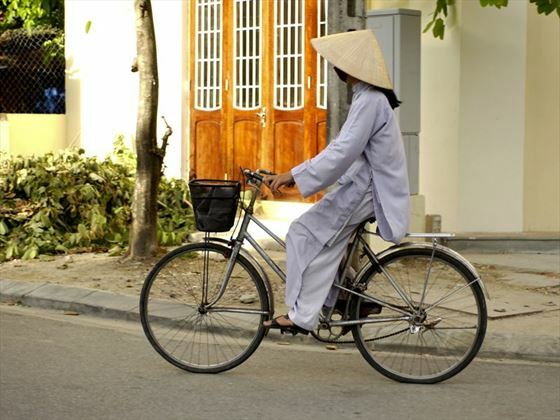 Discover the colonial port city, Hoi An, on foot and by bicycle. Tour Hanoi’s historic Old Quarter, temples and lakes. Welcome to Vietnam’s crazy capital city, Hanoi! Your trip begins with a welcome meeting at 6pm in your hotel. If you arrive early, wander through the city’s Old Quarter, which is famed for its 36 streets lined with Vietnamese tubular houses, temples, pastel-coloured French colonial buildings and even a Gothic cathedral, St Joseph’s. Take a stroll around Hoan Kiem Lake or head to the Chinese-style Temple of Literature and soak up the atmosphere of this frantic, fascinating city. Today you’ll explore Hanoi in depth with a full day of sightseeing. The capital boasts over 1,000 years of history which blends with modern malls and offices, set against a backdrop of beeping motorbikes. Travel by private bus to the Ho Chi Minh Mausoleum, Museum and palace complex, where you’ll learn all about the country’s famous revolutionary leader. Marvel at the grand European-style yellow palace and take a look at the humble wooden stilt house where Uncle Ho once lived. You’ll also spend some time at the ornate One Pillar Pagoda, a Buddhist temple. Your final stop of the morning is the Temple of Literature, a monument to the legendery Chinese philosopher Confucius and home to the country’s first university, the Imperial Academy. Have lunch at KOTO, which stands for ‘Know One, Teach One’ and trains local young people in hospitality skills. Hop on your bike for an afternoon cycle tour around West Lake, a distance of approximately 25 kilometres. 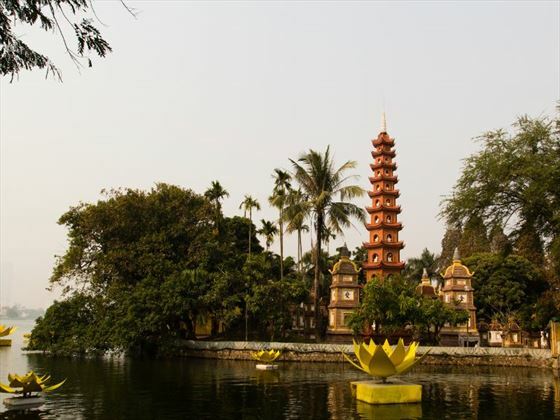 This is the largest lake in Hanoi and its banks are lined with bars and restaurants, as well as ornate gems like Quan Thanh Temple and Tran Quoc Pagoda. Note that the bikes we use throughout the tour are 2016 TREK 4300 or 4700 models and we recommend that you bring your helmet from home. However, we do have some you can use if necessary. After breakfast, take the 90-minute bus journey to Luong Son in the northwest. This marks the start of our countryside biking adventure. Today you’ll cycle approximately 60 kilometres along mostly paved roads. Enjoy the stunning scenery of lime-green rice paddies bordered by hulking mountains, tiny villages and grazing buffalo. There’s a support bus that travels with the group in case you don’t want to cycle the whole way. Mai Chau is home to a range of ethnic groups. Each has its own unique culture and language, including the people in Ban Lac, who are of Thai ancestry and live in stilt houses. Stop for a traditional lunch at Pom Coong Village and spend the night at a homestay with local hosts. The accommodation is basic, consisting of mattresses in a communal room with bedding and mosquito nets, as well as shared bathroom facilities. This is all part of the authentic Vietnamese experience. Get back on your bike for another day of riding through the unspoilt Vietnamese countryside. The journey of approximately 60 kilometres is leisurely paced, with plenty of stops to rest and take photos of the scenery. Take in the views of the valleys and sugarcane farms and get a glimpse of rural life as children play in the villages and farmers work the fields. Today’s final destination is the small town of Ninh Binh, which lies in a province known for its towering limestone karsts and rivers. In fact, the area is often referred to as ‘Halong Bay on Land’ because its floating rice fields are studded with limestone outcrops. Today your sea adventures begin. A private bus will take you four hours to Halong Bay, which is a UNESCO World Heritage Site and one of the New Seven Wonders of the World. The emerald waters are scattered with over 2,000 limestone karsts, formed over 500 million years. Halong Bay has countless caves, as well as forest-topped islands with beaches and floating villages, which are home to people who’ve lived in the bay for generations. Board a rustic Vietnamese junk boat for a two-day cruise on Halong Bay and kick-off the trip with some kayaking, led by your tour leader. You’ll dine on board and sleep in twin-share cabins which have air conditioning and private bathrooms. There’s also a cosy dining area and bar, as well as a deck where you can enjoy the views. Spend the whole day exploring Halong Bay by kayak. Paddle past floating villages while eagles swoop above you and venture into dark grottos filled with stalagmites and stalactites. If it’s warm enough, you’ll have the chance to swim in the South China Sea, as well as visit some of the area’s incredible caves. Spend a final night on board the boat and dine on seafood dishes. 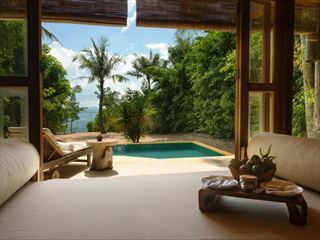 Wave goodbye to Halong Bay and take a 90-minute flight south to the city of Hoi An. This former colonial port dates back to the 15th century and has been designated a UNESCO site for its mix of well-preserved architecture. This includes Chinese merchant homes, Vietnamese tube houses, French buildings and a colourful Japanese bridge. Soak up the tranquil vibe and tree-lined streets. We’ll arrive early evening, so you can have a meal by the river or try some street food to round off the day. 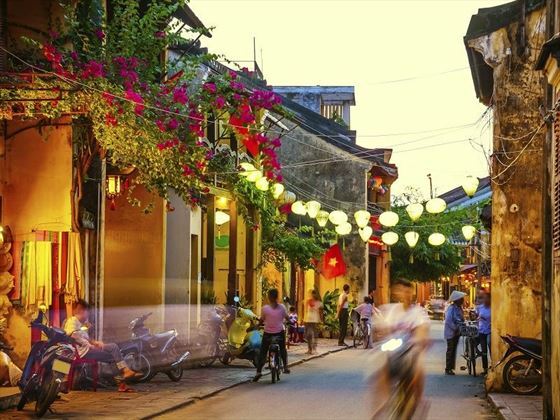 Start the day with a guided walk around Hoi An, which lasts around two hours. Learn about the city’s history and see some of its most impressive buildings, temples and ancient merchant houses. After lunch, you’ll get back in the saddle for a two-and-a-half-hour cycle ride out of town, through the countryside rice paddies and shrimp ponds to Cua Dai Beach. Back in Hoi An, there will be time to shop for souveniers and even order some made-to-measure clothes. The city is famous for its silk tailors who can create custom outfits in less than 24 hours, you can even get them shipped straight to your home country. Spend the final night wandering by the river and having a meal in a lantern-lit restaurant. You can leave the accommodation at any time and there are no activities planned. Either take a transfer back to Danang airport for your onward flight or continue exploring. Accommodation: five nights in a hotel, one night in a homestay, two nights on a boat. Transport: private bus, bike, kayak, boat, internal flight. Food: eight breakfasts, five lunches and four dinners. Activities: Temple of Literature, Ho Chi Minh complex, including the stilt house and museum in Hanoi. Mai Chau Pom Coong Village visit with lunch and Hoi An Ancient Town Entrance. 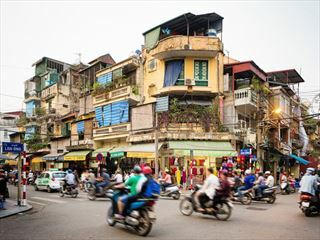 This brilliant 12-night escorted tour is the perfect way to explore cultural, historical and naturally beautiful Vietnam, exploring the likes of Hanoi, Ho Chi Minh City, Hue and Mekong Delta.